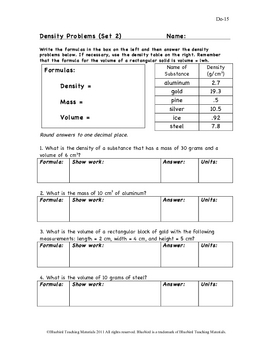 This 2-page density worksheet includes a box for students to write the formulas for density, mass, and volume. Using a table of the densities of six solids, students work eleven problems solving for either density, mass, or volume. 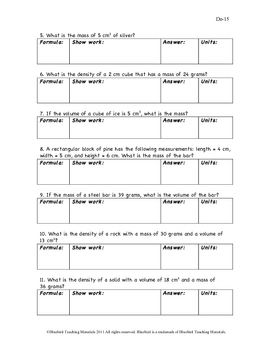 Each question includes boxes for the following: formula, showing work, the answer, and units. By having boxes for each part of the answer, students are reminded to write out each part of the answer. The 2-page teacher key is full size.